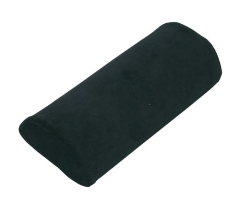 This Lumbar Roll is ideal for people on the go, who need lumbar support on different types of chairs. A semi-circular cushion that provides pressure relief and support. A firm visco elastic foam semi circle cushion ideal for all-round use under knees, arms, ankles, lumbar region or neck. Semi circle quality cushion. Wide variety of uses, perfect for positioning. Fits in between our soft and firm lumbar cushions. Wide variety of uses, perfect for positioning. Handy strap for attaching to chairs. The ComfyBack Deluxe Lumbar Wing Cushion is the best shaped Lumbar or Thoracic support to ease upper and lower back pain, and the symptoms of sciatica. Provides proper posture while providing firm support and comfort. Quality back cushion with adjustable elastic strap to fit to any seat. A contoured foam back support cushion with removable cover and elastic strap for fitting to seat backs. Has convoluted surface fitted with magnets to help with pain relief.